Effective and efficient research data management is one of your most critical everyday activities; it's also something for which you've probably never received training. This Data Management Best Practices Guide is intended to provide you with the resources you need to improve your workflow, and meet funder requirements to properly manage, document, share & archive your data. Browse the topics in the navigation panel on the left. If you need help with a data management plan, select 'Data Management Plans' in the menu above. Please feel free to get in touch with us if you have further questions, or if you would like individual- or research group-level support. If you have useful information that you believe should be added to this site, or have a suggestion of any kind to improve the content, we encourage you to contact us. A list of the sources of information used in this site is provided on the 'About' page (above). The book features guidance on: how to plan your research using a data management checklist; how to format and organize data; how to store and transfer data; research ethics and privacy in data sharing and intellectual property rights; data strategies for collaborative research; how to publish and cite data; how to make use of other people's research data, illustrated with six real-life case studies of data use. 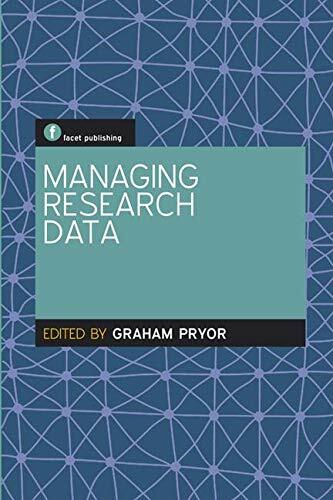 This volume provides a framework to guide information professionals in academic libraries, presses, and data centers through the process of managing research data from the planning stages through the life of a grant project and beyond. Illustrated with real-world examples throughout, the book offers practical advice on the components necessary to create a culture of effective data management, including skills required, legal obligations, strategies and management plans, and the data management infrastructure of specialists and services.